Good Morning and Good Monday Ladies. 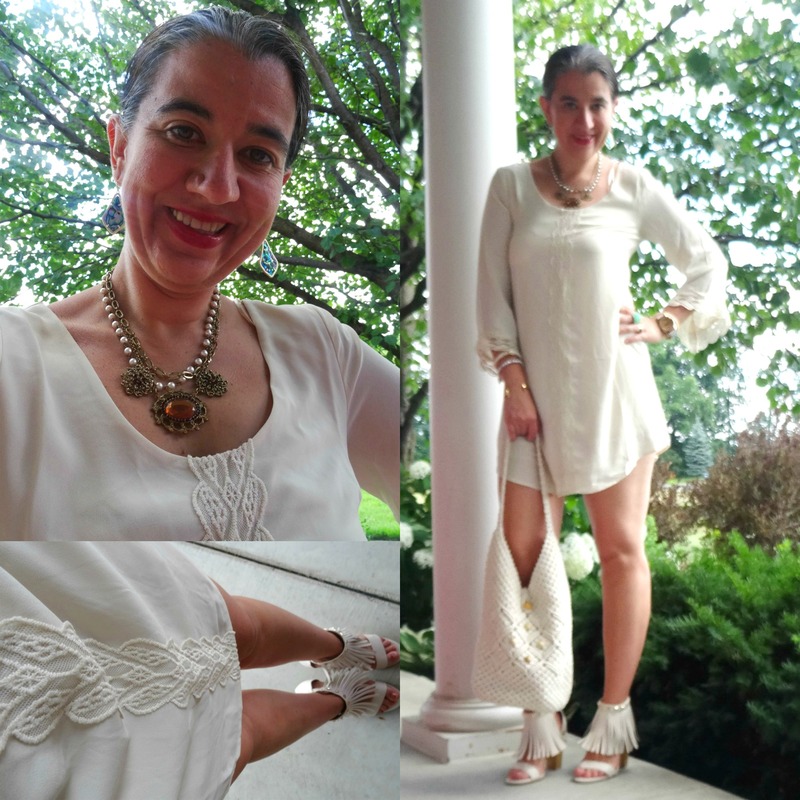 I am so behind with posting outfits and I still have several from June (like this last White Dress) plus the outfits I wore on vacation. 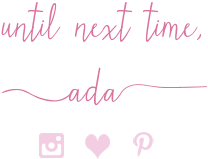 But I am so busy come Summer and the blog goes a little on the back-burner. I hope I am not the only one. If so, oh well. Life comes first, as it should. Before I went on vacation and even when I came back I showed you that the last week of June, was all about Little White Dresses - that I have plenty of. Well my dress today is Off White or Cream but it still falls under a LWD category and it is from Nordstrom. I ordered it almost two months ago but it was back-ordered and I finally got it a few weeks ago. 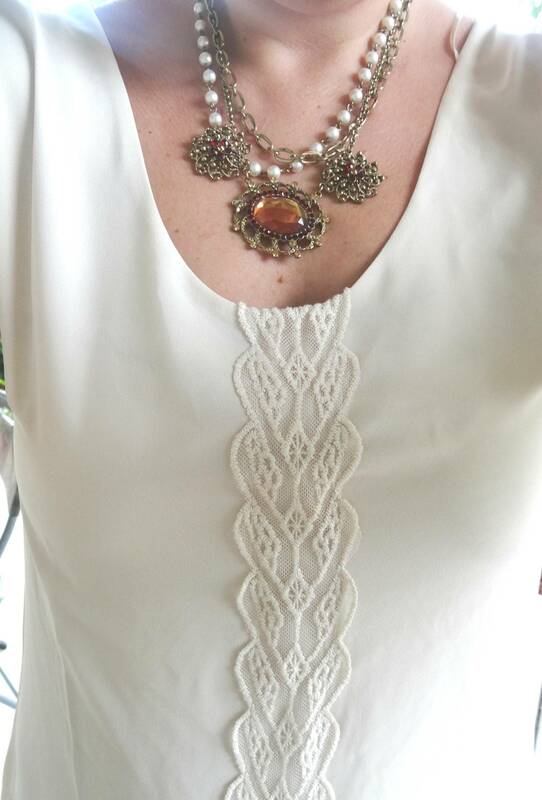 I love the lace-adorned bell sleeves, half-open V-back and the lace detail on the front - all perfect little Bohemian details. So, for the first time wearing it out I decided to go all Bohemian and Monochromatic and paired it with my Fringe Block Sandals and a Crocheted Summer Bag. 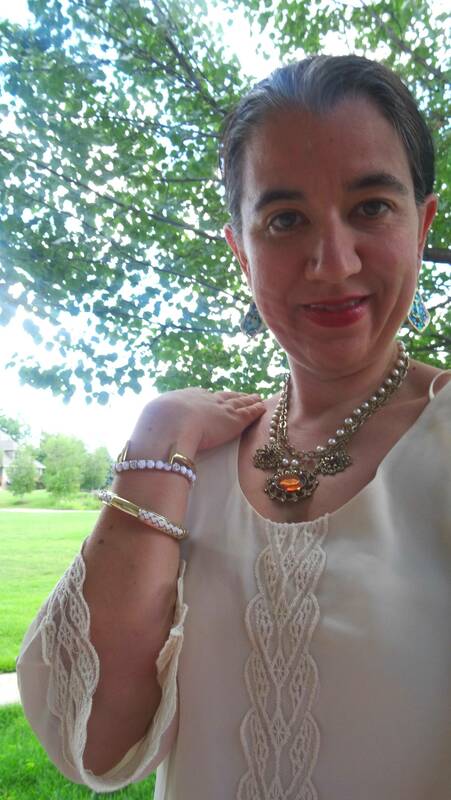 I also accessorized with a Pearl+Brown Stone Statement Necklace, some White+Gold Bracelets and Dangly Abalone Earrings. Do you like how I styled this little chemise dress? Do you have a similar one of your own? Off-White/Cream Bell-Sleeve Shift Mini Dress w/ Lace detail: ASTR via Nordstrom (New) (similar, Steal), (similar, Great Deal, love this), (gorgeous option w/ red embroidery, Splurge, my Favorite), (similar w/ cold shoulders). Ivory Crocheted Buckle Bag: Meijer's (New) (similar, Steal, love this), (similar, Fantastic Deal), (similar w/ fringe detail, Great Deal, my Favorite). Iridescent Dangly "Alex" Earrings in Gold Abalone: Kendra Scott via Rocksbox (New) (identical), (very similar, love these), (similar, Steal), (similar, Great Deal). 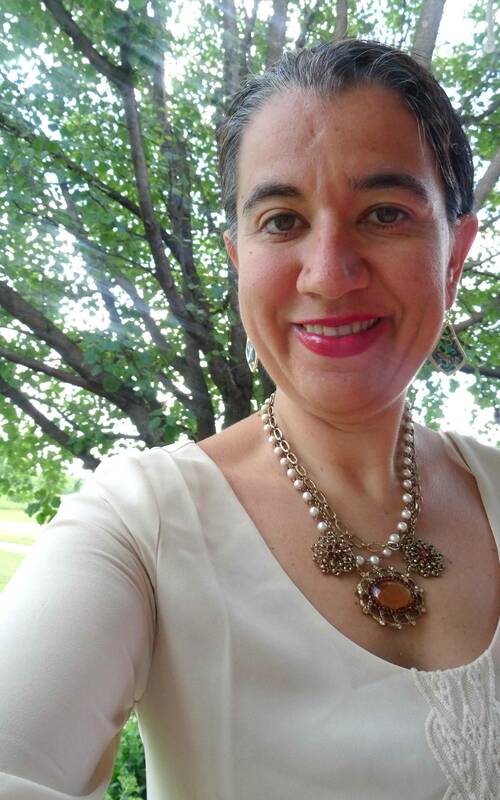 Gold Tone, Double-Stranded Chain+Pearl Necklace w/ Oval-Shaped Large Burnt Orange Stones: The Limited (similar, Steal, love this), (similar), (similar, on Sale). 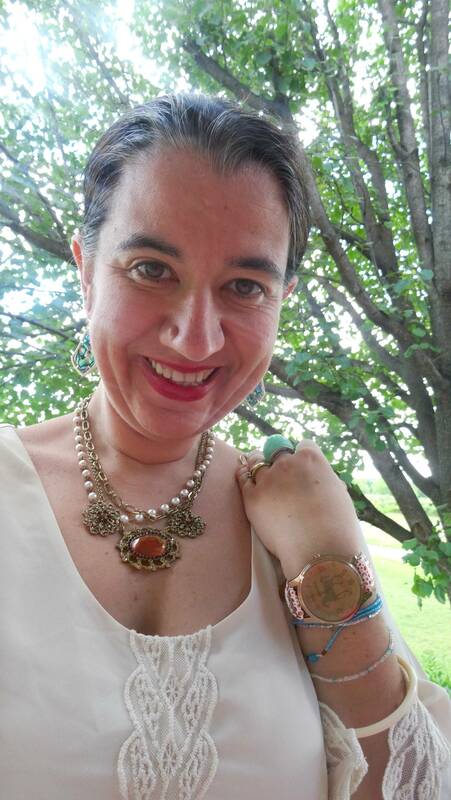 Red+White Faux Snakeskin Watch w/ multifaceted Bronze Glass Face: A Local Boutique in Albania (very similar, Great Deal, love this), (similar, Steal, my Favorite), (similar, on Sale). Gold-Tone, Double Bar Adjustable Cuff: Soko, borrowed via Rocksbox (New) (very similar, Steal), (similar, Fantastic Deal, love this), (similar, Great Deal), (similar bold option, my Favorite). 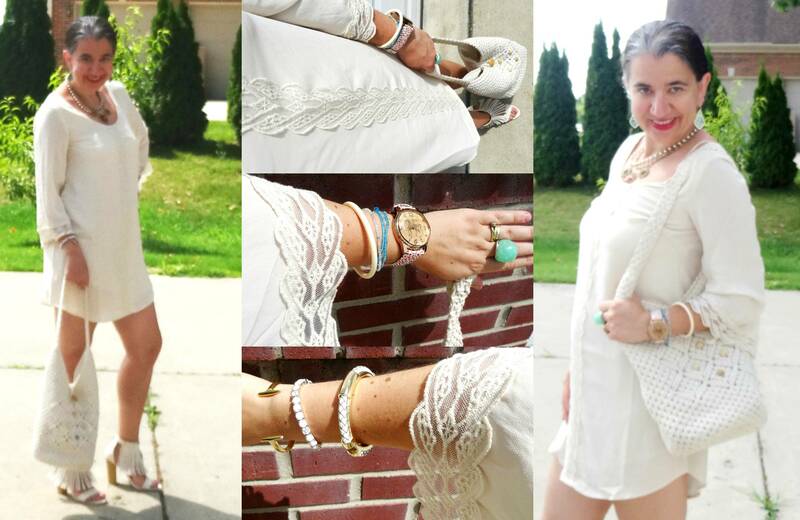 I got a brand-new outfit tomorrow and I am also recapping the last week of Little White Dresses from June. So stay tuned. =) To see more White Dresses check out this Flashback Post.